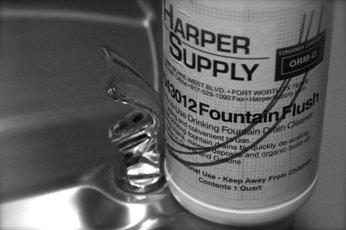 Fountain Flush is a ready-to-use drinking fountain drain cleaner that is recommended for de-scaling and lime removal in drinking fountains caused by hard or soft water scale, mineral deposits and other organic buildup that is often found in drinking fountains. Can also be used in ice machines, on kitchen walls and floors, food processing equipment, steam tables and milk tanks. Fountain Flush can also be used as a drain maintainer for keeping your drinking fountains flowing and free of build-up with quarterly or monthly intervals.